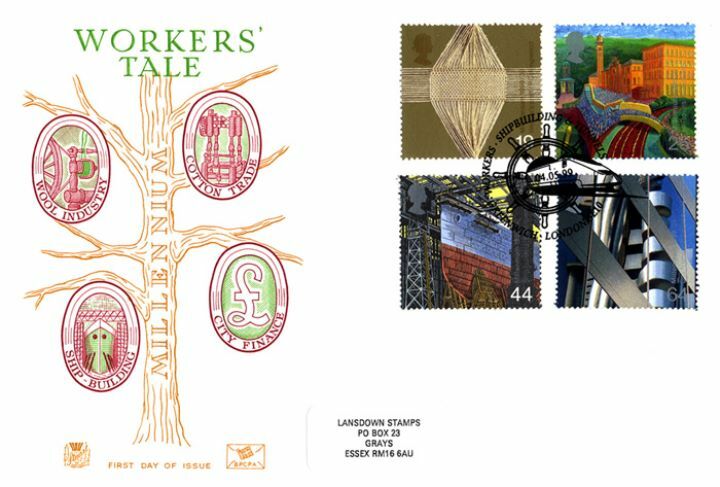 The above Royal Mail Workers' Tale stamps were issued on 04 May 1999 by Royal Mail and feature the following stamp designs: 19p Weaver's Craft; 26p Mill Towns; 44p Shipbuilding; 64p City Finance. The Millennium Cover No. 5 first day cover with the Greenwich, EuroStar - Shipbuilding & Tunnels, Special Handstamp postmark has been produced by Stuart and features these stamps which can make a very collectible and lovely gift.